We are going to see a major shift in boardrooms. Traditional static presentations are already outdated and decisions are taken in real time. You heard it right; Digital boardrooms are already in place. Board members are connected to live data and decisions are taken in real time based on To-Be scenarios and predictions. Digital platform should be capable enough to analyze, provide insights using algorithms, deep insights through patterns, provide predictive analyses and derive multiple options to arrive into decisions. Decisions touches every layer. From business -> Process -> Application -> Platforms -> Data. Your decisions are derived and backed up by line item level data. Sounds like a concept? No; it’s a reality with SAP new digital innovation ‘SAP Digital Boardroom’. SAP Digital Boardroom will keep it real. Real things that really happening in day to day business, at the same time of important board meetings. Mindful of your pipeline, focused on linearity of business flow. Based upon on probability and system feedback how you like to do. Flux your expenses, control things or do over investment. You can do simulation and prediction in live system. This is the new level of business. Take this insights and turn it into actions. Get rid of static presentations, making faster and better educated decisions across whole value chain in company. Coding solution with stunning user experience, people can access data in finger tips in boardroom/desktops/mobile. In SAP Digital Boardroom S/4 HANA is in the center. Real time data of company performance, financial data, customer data, work force data and supplier spend is available in boardroom platform. It will give board a clear insights about what is going out in the market? System will help to compare with your competitors, market trends, macro-economic data, latest market cap, share prices, currency fluctuations etc. in real time. Yes at the time of board meeting itself. Board members can access company top to bottom data in real time. System can analyze the past and present performance; simulate the future based on the pipeline of opportunities. System will pull out the opportunities out of pipeline data. Board can analyze this pipeline across the globe or a region and if they need they can drill down to a particular location at the moment of meeting. If any particular location is looking more positive, decisions to tackle this new opportunities with increase in sales count can be taken after analyzing the impact on financial forecast due to increase on head count using simulations. For existing customers system will pull out open invoices and other details with current opportunities. In case of any key customer engagements is happening through floor marketing using SAP Hybris at the time of board meeting ; in real time you can track number of visitors and all engagement happening in each product/demo stations. Number of visitors in each and every product and time spent in each product demo is analyzed. In digital boardroom using algorithms, pass this real time floor data into the sales pipeline. Based on historic conversion rate and level of customer interest, system will convert this data into leads, opportunities and potential ‘can be close’ deals. This will help the board to understand how much upside they will get in sales and can derive better sales forecast. System can predict the actions based on this forecast like adding additional work forces/hardware etc. SAP Digital Boardroom is having an alert management module evolving the opportunities based on pipeline, customer interest and enquires. Alert based on sales related travels, travel situations, ticket prices is embedded. Simulates and predicts how to bring the cost into the acceptable level in case of any upward trend. Traditional boardroom approaches will be faded away in coming days. No decisions are postponed like outdated board meetings where the impact are analyzed in a time consuming process. By the time you come out with the decisions the market behavior will be shifted to a new scenario. Board will be running behind the situations, not ahead. 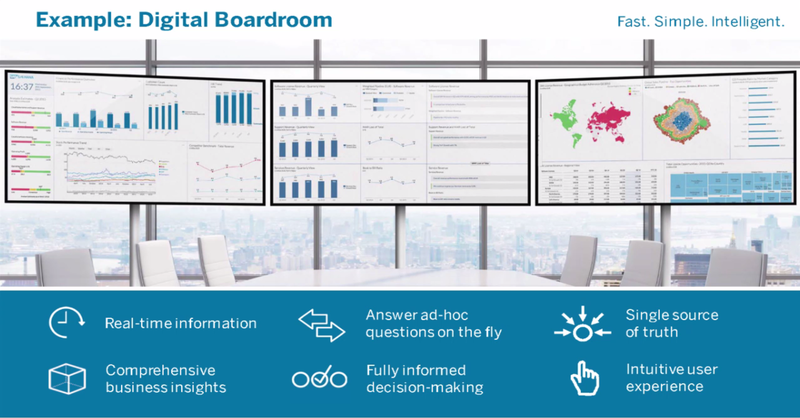 SAP Digital boardroom will help the board to run ahead. New modern day business demands flexible, collaborative and integrated digital platforms like SAP digital boardrooms to run live business. It’s no more a concept but a reality.